The previous team pursued chasing after some gold assets in Utah. Those gold assets are currently in production. Then, they went and staked a very large claim package in Alberta, Canadaa very large polymetallic deposit, which leads up to myself and our new team. We got involved in December 2014 to focus on graphite. We first went looking for graphite in Brazil, and ended up in Madagascar. For instance, in North America we have what we call the 43-101 Guidelines or Standards. If you were in Australia, or an Australian company, you would use JORCthose are their guidelines. Russia has different guidelines, and even South Africa has different guidelines. Depending on where you are, or the home base of your company, you have to use different guidelines around that. 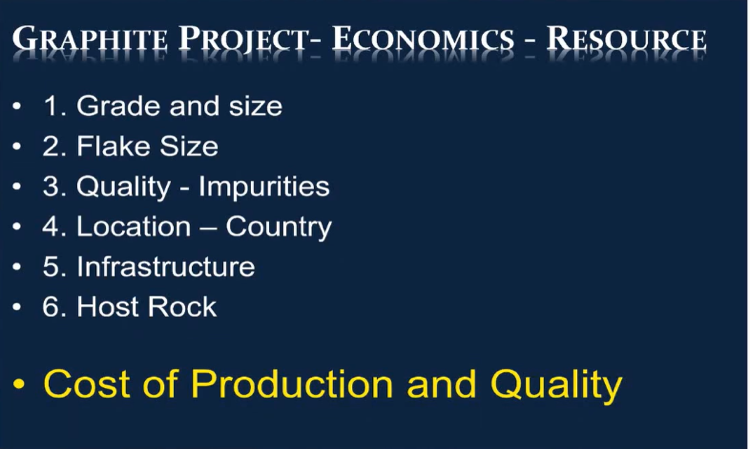 Again, this is a resource study, this is not a feasibility study, but within our resource study we will have taken into account some of the economics of the deposit. When you’re putting out a resource study there’s a number of things that we look at, and a number of questions that the people ask when they’re putting out the resource studyobviously, the grade, and the size of not necessarily the deposit, but the size of the resource that you put out in conjunction with the study. Again, the most important things that you’re going to look at when you’re looking at a project, and seeing if it’s going to get into production, is actually the cost of production, and the quality and quantity of your material, and those are some of the things that you’ll take into account when you make a decision to get into production. In our case, we have decided, as a team, that we want to build a planta pilot plant is what we’re officially calling it. The great thing about our pilot plant, and specifically because we’re in this weathered type saprolitic material, we can also have production from this plant, so we’re very excited as we move this forward. 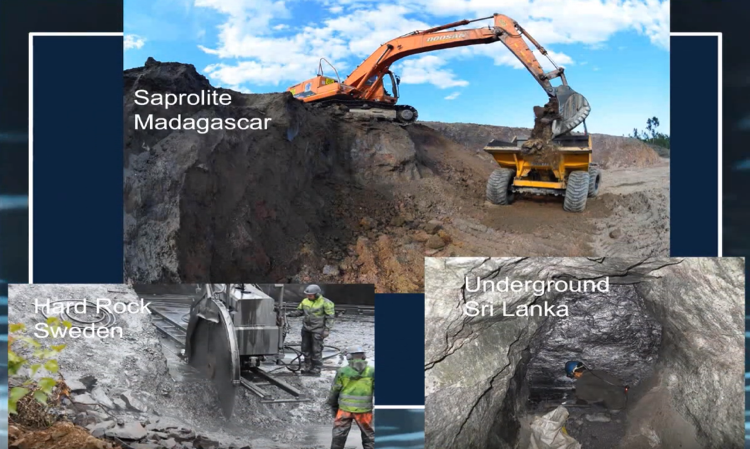 Here’s a comparison of what it looks like in Madagascar versus here in Canada in hard rock in Canada, saprolite in Madagascar. In January 2017. . .I was in Madagascar are taking a bunch of samples. You can see here that we can just go in simply with a shovel, dig up the materialit’s a sandy clay materialand put it in a bag. Here are some guys that dug a trench, it’s all hand dug. When we were doing some of our exploration work on our property we were able to go down four and five meters deep with these type of trenches. Now, at the end of January I went up and I was helping another company take a one-ton bulk sample. Here I am, freezing in the bush in Québec in January. I had to go in with a jackhammer, I had to use a concrete cutting saw in order to cut out the material. It was beautiful material, but again I had to go in, chisel it all out. If you were putting the hard rock deposit into production, what you would have to do is you would have to drill holesobviously with a big machine, not by handand then you’d have to put explosives down in the ground, you’d have to blow it up. Then, you’d have to go along with your excavator dump truck, pick up the big pieces of rock, put them in the dump truck, take them over, crush and grind them really fine before you could process it. I think that really shows people the difference between the two. You can see from the press release that there is a sensitivity table on there. The company, in conjunction with Micon International, the entity that wrote the resource report, we looked at all the different numbers and decided on which number best fit what we wanted. We had always mentioned to investors that our grade would be somewhere around 44.5%. I’m very happy because it came in at 5%. I’m very happy that the tonnage exceeded the numbers that we were looking to achieve. Our maiden resource is 4 million tons at 5%. That gives us approximately 200,000 tons of graphite. 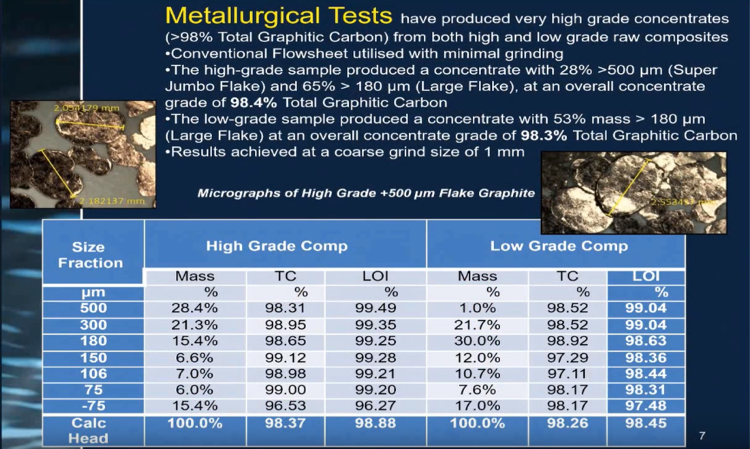 Now again, when you’re talking about 200,000 tons of graphite, also remember that you will lose some of that in your processing, you can never get 100% efficiency out of a processing plant. We suspect that we’ll get somewhere around 90, 95%that will make us very, very happy. I do also caution that when we first start up we won’t get those efficiencies until we work all the bugs out of the processing plant. We drilled a total in the Southwest zone of 24 holes. There were 18 holes drilled with the RC rig, or the air core rig. There were six holes drilled with the diamond core rig hereactually the blue ones are the diamond core, so you can see them. We did not do any trenching across this deposit. When we were doing the resource and putting all the numbers together, Micon determined that this zone would be excluded from the resource because we hadn’t done the trenching across it, therefore, no metrics from the Southwest zone are included. 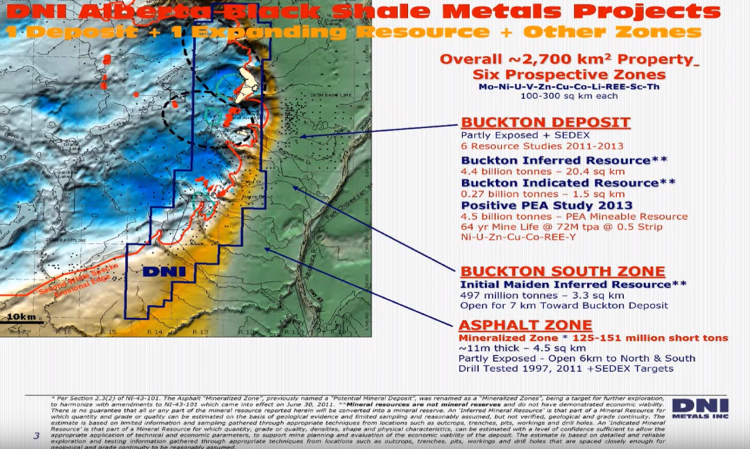 I’m actually excited about that because of the numbers that are in our resource, as a standalone, are fantastic, and we believe the Southwest zone is very, very similar to the main zone. We’re going to go back this year, dig some trenches across here, and we’ll be able to add some nice resource from the Southwest Zone. We were able to add some Inferred resource as well, all the way up to the trench up here, but the point I make on that is that we know that these things run for over 5 km, and we’ve only done work on about 750 to 800 m over that distance. 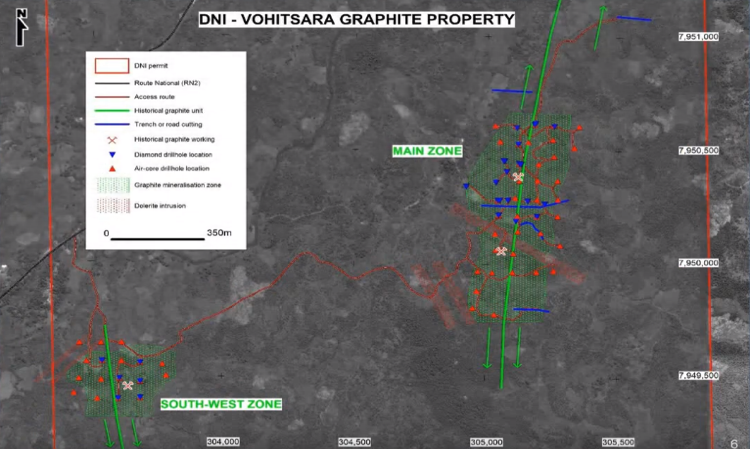 We do know that the graphite does extend in this particular zone to the south, to the north, and we also know it goes at depth. The average depth that we drilled holes just in the saprolite was 28 msome of them were 18 m, some of them were 46 m, but the average depth was about 28 m. Again, only in that weathered saprolite area. 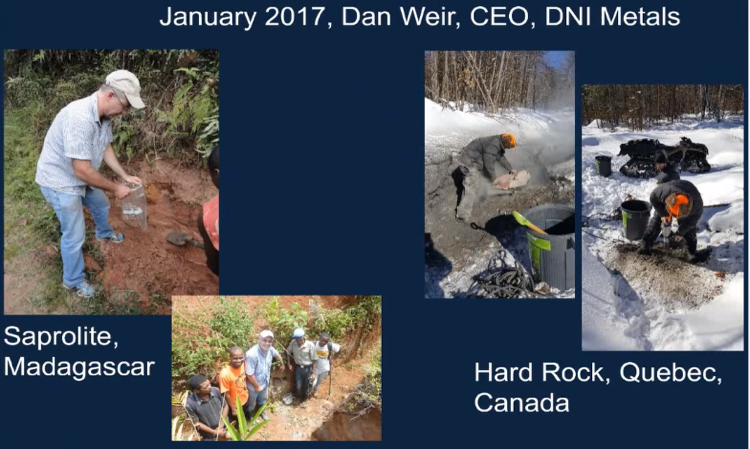 Dan Weir: In Utah, our previous management team had focused on a gold deposit in Utah. In 2008 or 2009don’t hold me to those datesDNI sold that deposit, and kept a royalty. The gold started producing, or started paying us a royalty in 2015. We were paid small, we were getting on average for the last couple years about $3,000 or $4,000 a year. DNI decided to monetize that. The problem the guys were having at the deposit [was] there was a number of people who had royalties on the gold deposit, and it was very difficult for them to make any money at their production, so they bought out all of the royalties including ours, and they gave us $50,000 U.S. for that royalty. We felt that was a very fair value for that asset. 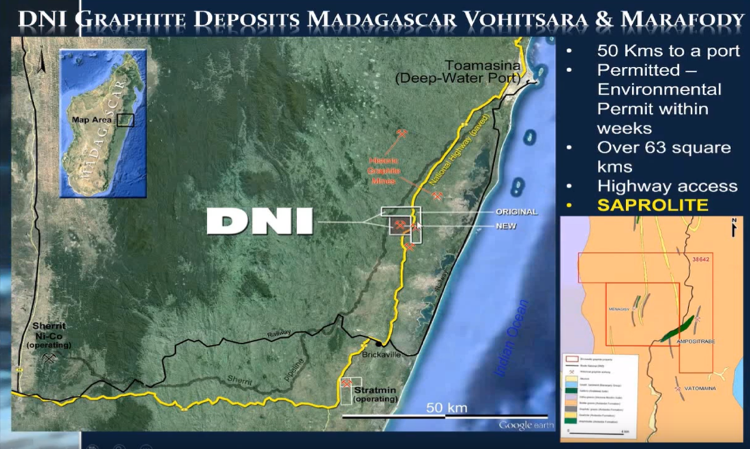 Dan Weir: On Dec. 18 we put out a press release talking about this polymetallic deposit. As I mentioned before, the previous management team, before I got involved or before the current board got involved in DNI, were developing this project. They did an amazing job at doing it, they had drilled a number of different deposits in this area, they were able to do a full PEA on itthat’s a Preliminary Economic Assessment studywhich they completed in 2013. Maurice Jackson: As a reminder, DNI Metals trades on the CSE symbol DNI, and on the OTC symbol DMNKF. For our audience, DNI Metals is a sponsor, and we are proud shareholders for the virtues conveyed in today’s message. Last but not least, please visit provenandprobable.com for mining insights and bullion sales. You may reach us at [email protected].